Other than politics and religion one of the most controversial topics in the Deep South centers around the origins of Brunswick Stew. That topic ranks right up there with whether barbecue sauce ought to be sweet or tart, how you ought to fry chicken, and what belongs and doesn’t belong in cornbread dressing. I prefer not to get into the Brunswick Stew argument so to solve that problem I’m officially renaming my family’s recipe. It has traditionally been known as Brunswick Stew but from this day forward, I plan to call it Chambers County Alabama Stew—Smith/Estes Version. When I was a little girl in the 1960s, my Smith grandparents kept stew in their freezer in little plastic boxes. It was the original fast food. Warmed up and spooned over a slice of Sunbeam Bread with a few potato chips on the side it was heaven on a plate. My Dad said when he was a boy in the 1930s, the making of stew was a community activity. The neighbors would get together and someone would donate a hog, another family contributed hens or chickens, and other families brought vegetables. They cooked the stew, ate together, and everybody took home enough for supper that night. Stew became a part of big community events like the Rural Electric Cooperative’s annual barbecue. And even today stew takes a place of honor at the barbecue fundraisers for the Ridge Grove Volunteer Fire Department. One of my mother’s cousins told me that it may have been changed since then, but when the fire department first started barbecuing they started with my grandfather’s recipe. In my family, stew isn’t just a memory it’s still a staple. But I have to admit, the original-original stew recipe doesn’t hold much appeal for me. I’m a wimp when it comes to gastronomy and I’m a bit squeamish about the idea of eating something made with a hog’s head or any other internal parts I’d rather not think about. But I do love today’s recipe for the newly named Chambers County Alabama Stew—Smith/Estes Version. Several years ago my parents modernized the original recipe taking out things our family didn’t like (We like our stew without butterbeans and okra—we think those are best in vegetable soup.) and removing a huge percentage of the fat content of the original version. Making it is still a pretty big job, but with this adapted recipe you can do it indoors on a stove instead of having to cook it over an open fire in a pot the size of a small swimming pool. Be prepared. This recipe makes a lot of stew. 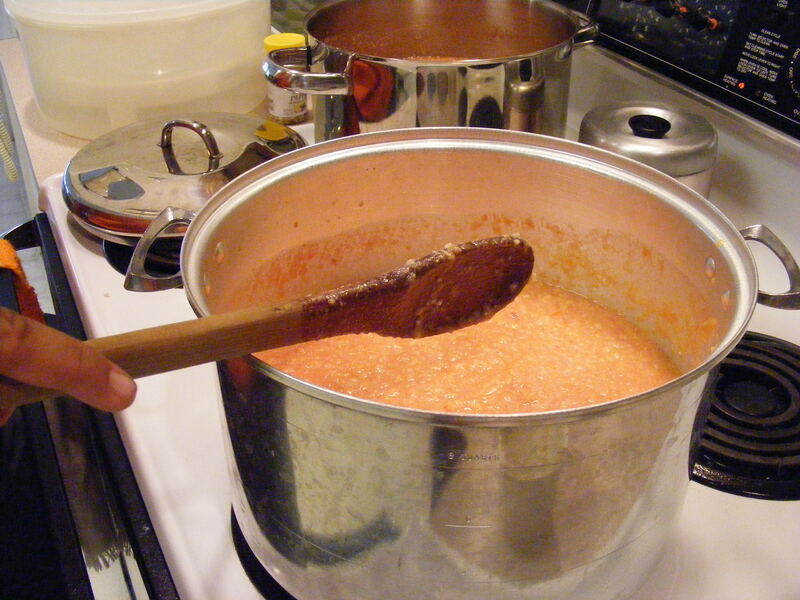 The ingredients usually fill two large stock pots so as ingredients are prepared, divide between the two pots. Grind meats in an old-fashioned food grinder or a grinder attachment of a mixer or chop fine in a food processor in small batches. Grind onions and potatoes or chop fine in food processor in small batches. Puree tomatoes in a blender. Puree whole kernel corn in a blender. (Don’t use already creamed corn, for some reason it tends to make the stew scorch on the bottom). Cook on medium-low temperature, stirring frequently, until potatoes and onions are done. Stir in ketchup and lemon juice. Add salt and hot sauce to taste or leave it mild and add seasoning to individual servings. If the stew is too thick, it can be thinned with water or broth. Scoop into pint and quart-sized freezer containers and cool before freezing. This entry was posted in Uncategorized and tagged Alabama, Beef, Brunswick Stew, Chambers, Chicken, Cook, County, Estes, Grove, Home, Karen, Lewis Smith, Lowry, recipe, Ridge, Stew, Sunbeam Bread, Tabasco. Bookmark the permalink. You should be writing for Southern Living. If you know anybody at Southern Living, feel free to pass that word along. I could probably be persuaded.